"We, indeed, discovered an unusual signal. GOOGLE+ just tried to sneak the "New Google+" on me. NO thanks. It makes it MUCH harder for me to use Google+. I'm updating stuff on my Studio PC, which now has a new 3TB drive in it. I haven't done anything with that drive yet, not even formatted any of it, but when I do I want everything up to date. A solid open-source video editor. A solid open-source video editor. This seems all full of improvements. Available in Linux and Windows, though you'll need to go to http://www.openshot.org/ to download that. Not that I'm in any hurry to try this, but it occurred to me that I could improve my old uni laptop by replacing the internal hard drive. It currently has a 1.2Gb drive which is inadequate even for the XP install on that (though part of that might also be the university programs installed on it as well). It seems that you can get far larger internal drives for old DELL laptops, but the limiting factor is that fact that it's a 32bit PC. After a bit of a search on whether this was a Windows thing only, I found this link - https://ubuntuforums.org/showthread.php?t=1124191 - that suggested it was a BIOS issue, and that without a BIOS upgrade it couldn't access partitions larger than 128Gb. But, supposing I got a cheap drive (like the one at https://www.pccasegear.com/products/22914?gclid=CjwKEAjwl4q-BRDtzJmSk-uGunkSJACmCOY-26ZUOuJs2RLmMBFLG96gXovL3ZSvf5jOqZDYafysPRoCoDjw_wcB&gclsrc=aw.ds), there'd be more than space for lots of partitions under lnux. And maybe more RAM it it might be a very useful laptop. And what would I be using it for? Maybe: stop motion videos; timed snapshots; an extra terminal for SL / OS and situations where taking a laptop to a place would be way better than taking a phone or a cheap tablet (like a presentation, or recording). But it seems to me that there's a limit to what I should spend on any potential upgrades to the laptop, and that's what it would cost to get a more recent cheap laptop. For example, the one linked to here. Still, I feel it's a waste to just let the uni laptop rot away. Ideas anyone? What I find interesting is that much the same was promised about the first internet - the international telegraph system. Cathy brought a CHIP with her, for me to play with. Interesting! Something Cathy's got me trying. Seems interesting. Regarding Krita, this might be useful to anyone wondering what it looks like and how to get started. Although it's meant to be used with a tablet, for obvious reasons, it can still be used with a mouse for some basic work. I just love these old computers, especially the AKAT-1 and the Datasaab D2. I just love these old computers, especially the AKAT-1 and the Datasaab D2. The AKAT-1 looks like a prototype desktop, that may could walk away if were bored with its operator. And the Datasaab D2. makes me think of something that might have appeared in a student film, and would talk in monosyllables, like "HELL-O, I AM A COM-PU-TOR!" The AI you're having without knowing you have AI? Fractal figures. Seen a lot in Nature. I just want to say merci beaucoup to matthen for all his work, absolutely addictive!! One of those "Impossible Figures". Penrose triangles appear prominently in the works of Escher, who not only inspired creation of this object (Escher 1954, Penrose and Penrose 1958), but also subsequently publicized it. I was very tempted by this, since I have PowerDirector 13, but I haven't used it (or any other video editor) in over a year. And PowerDirector is most likely out NEXT month, so best to wait on the sales of THAT instead (if at all). Must do some more video projects. I do like PowerDirector as a video editor, and went from the AVS Video editor to that, after I found that PremierPro needed more resources than my PCs had. It's fun. This is been a year of "not doing too much", after a good six years (off and on) of Masters, so maybe later. It looks like something Obi-Wan would arrive on. So how does one TURN or STOP? I tend to get a bit lost with this at times. I used this design in a 24 hour comic back in 2013 (http://lauras24hourcomics.webcomic.ws/comics/262), so it's nothing new. "Could" being the operative term here. "Could" being the operative term here. Practical flying cars have been around since the 50s, but have either cost too much, require the driver to have a pilot's license, or just don't have any real demand. And this is year old news, but very encouraging all the same. Now I used to work in the Australian Bureau of Statistics. I can appreciate what they're doing with this! I just found this on a search about open source in government. I just found this on a search about open source in government. Interesting idea. Governments are always looking for ways to cut expenses and use of open-source software fits that perfectly. Of course it'll never be right for ALL government services. Day two on the Linux distro search. Day two on the Linux distro search. As my DELL PC has a hard drive size of only 1.2 Gb (about the size my XP PC had back in '97) the larger distros are JUST TOO BIG. So I did a custom search at Distrowatch for an install of 250mb or smaller and ot some interesting results. Some of these run on a Raspberry Pi. Here's that story again. What if "consciousness" is merely the "narrator function" of our minds making up stories about ourselves? I finished creating the model of the house using Sweet 3D Home. I finished creating the model of the house using Sweet 3D Home. I was sufficient to get what i wanted. Now I'll save this as a new project and move the furniture around virtually to see how it lo0oks and functional that might be. And once I'm satisfied, I might move the furniture around in real life. Ha ha - for REAL! 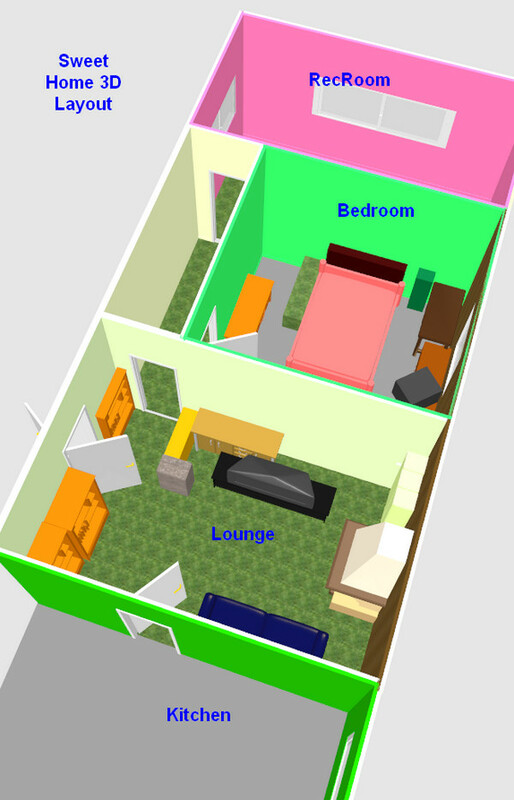 I finished creating the house plan in Sweet 3D Home. 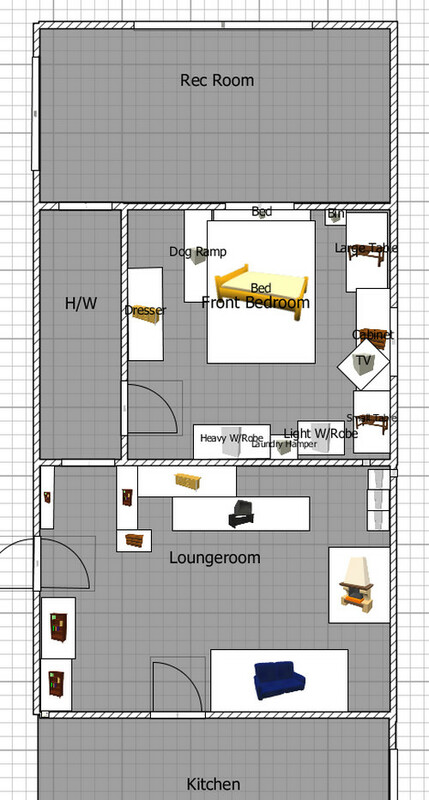 I finished creating the house plan in Sweet 3D Home. This is (+/- 5cm) to scale. I've been running around the house with a tape measure just to get correct sizes. Of course most rooms still need furniture. I might unpack the textures and extra models I downloaded but usually forget to install. Anything not in the inventory is replaced by a generic box! It's that time (especially now Bobby is gone) that I usually rearrange furniture. It's that time (especially now Bobby is gone) that I usually rearrange furniture. In the past I've used Sweet 3D Home (see http://www.sweethome3d.com/) to do this and now's no exception. This time around I've added more rooms for the front of the house. Not quite complete yet, but I expect I need to rearrange the RecRoom as well. "Dr. Christian Hellwig of the Max Planck Institute for Biophysical Chemistry in Göttingen, found evidence that information in our central nervous system is phase encoded, a type of coding that allows multiple pieces of data to occupy the same time. He said, “Our thoughts, our will, our consciousness and our feelings show properties that could be referred to as spiritual properties…No direct interaction with the known fundamental forces of natural science, such as gravitation, electromagnetic forces, etc. can be detected in the spiritual. On the other hand, however, these spiritual properties correspond exactly to the characteristics that distinguish the extremely puzzling and wondrous phenomena in the quantum world.”"
Whatever. Sounds a bit like wishful thinking to to me. Not to say that there couldn't be a soul, but this probably isn't that. I remember it from when I was a child! 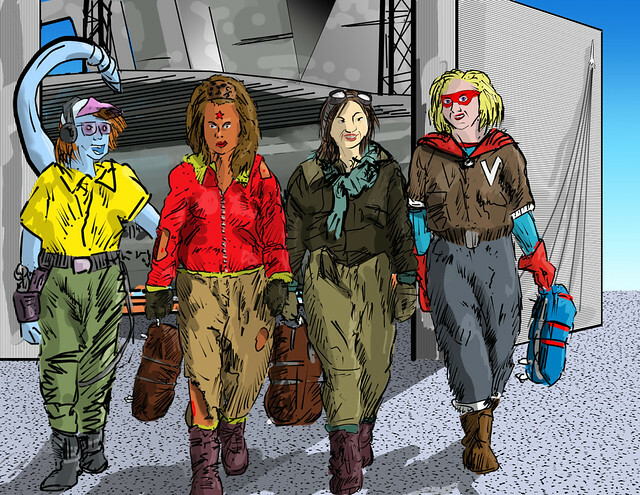 Neeta the mechanic is guiding Octobriana, Jenny Everywhere, and Miss Victory out to their new assignment. Their mission is a recon of enemy territory, only that territory is on another planet! The planet code-named Doppelgänger appeared from deep space last month. Astronomers were astounded to find that the continents and oceans of Doppelgänger matched those of Earth closely. Was there also life there, and what would it be like? The race is on to beat Nazi Germany to find out! This is my 2016 contribution for Jenny Everywhere Day, where people are involved to draw and share Jenny Everywhere as they like. I prefer to show Jenny with other open source and public domain characters. In this instance Octobriana is the Soviet representative and Miss Victory (fresh from smashing nazi spy rings) is the United States representative. Neeta is mysteriously working for the U.S. Space Force, though no one seems to question the fact that she's not exactly human. 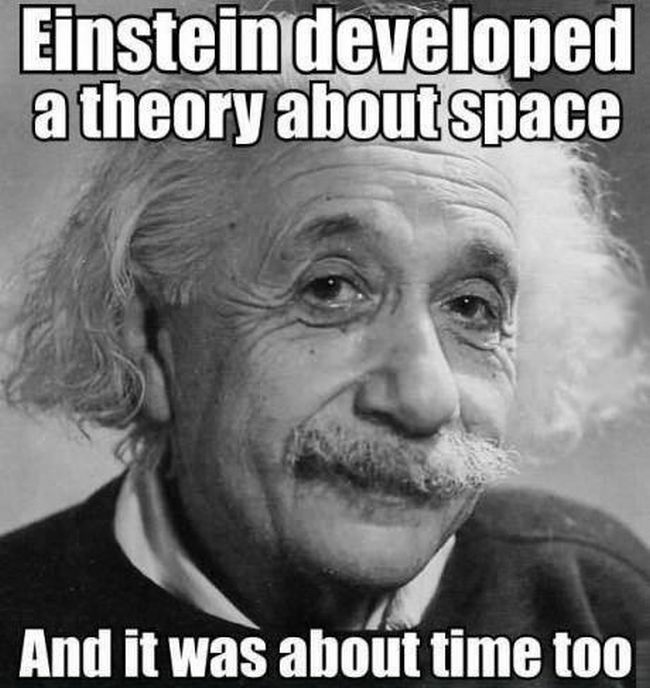 Why time doesn't go backwards. I don't like GIMP, but that's mostly because of its interface. Otherwise it's a fairly capable free graphic image manipulation program, and I do like Script-Fu. This pack makes it look more like Photoshop. Might give it a try, because whatever else, Photoshop looks good.. This is, it seems, SERIOUS. So, I was updating SHOCKWAVE when this popped up. So, I was updating SHOCKWAVE when this popped up. It seems that Adobe no longer have a pre-ticked "Install this unwanted software" box on the download page, but this instead. If I wanted to install CHROME, I'd do it separately (which as it happens i have for testing purposes), not as part of a plug-in update! And it's come at a time when I've been considering upgrading Anime Studio 11 to Moho (the new-old name for the software) 12. But the email I got today about that had the upgrade price at $US 199! I probably will upgrade to Moho eventually (after a sale where the price is only $99 or less) but it might be fun to play around with this first. The thing is, I already have this! Oooh, ooh, excited by this! Even so, I will probably wait until a SALE before upgrading. "Part of what makes ProjectSauron so impressive is its ability to collect data from computers considered so sensitive by their operators that they have no Internet connection." !!! A very clear set of targets there! Gosh - I wish I did a lot of sound work. This cross-platform suite of audio programs looks really capable. And I STILL haven't completed any animations with this. Too much focus on other stuff.